Timbi’s Dream is an adventure in rhyme. 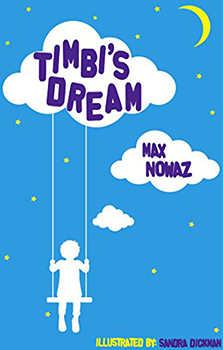 It stirs the imagination in young minds and makes it leap into a different plane as one follows Timbi’s adventures in a sequence of dreams, brought on by the effect of a strange jar of ointment his grandmother had left behind, on her last visit. His mother uses the ointment to soothe Timbi’s ears when they turn red after sunburn. However, it has a very strange effect on Timbi that night, when he goes to sleep. He suddenly finds he can fly. As he flies out of his window to meet a little girl and together they have great fun flying around. The next day when Timbi tries to tell his mum and brothers about it, nobody believes him. Timbi forgets about the dream as his ears get better until a few days later when his ears get sunburned again and his mother puts more cream on them. He then has a similar dream again. What can Timbi do to convince his brothers? The whole story is told in simple rhyme form which makes it more interesting for young children and can help aid learning ability and reasoning. There is also a twist at the end of the story to fire their imagination.